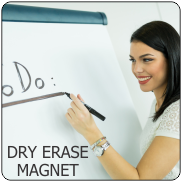 Starting with our two sided flexible magnetic sheeting, we laminate each side with pressure sensitive glossy vinyl in your choice of colors. Choose from 32 premium colors. Hundreds of other colors and patterns are available too. If your product is not shown on our website, please call for a quote. 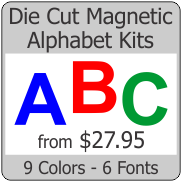 Available in several popular roll sizes and cut shapes, we offer discount pricing for larger orders of all our magnetic products including two sided magnet.